On my paternal tree, Andrew Colvin of Saugerties NY was listed in the 1850 census as a stone cutter. His grandfather John Colvin was born in Kirkudbright, Scotland in 1752. John immigrated to the United States in 1772, first going to Dutchess County, New York, then settling in Albany. A soldier in the Revolutionary War and a farmer by trade, John Colvin also served in the NY State assembly from 1809 to 1810. In some of the census lists that Andrew Colvin appears, he is recorded as a farmer. The local farmers would often sometimes in the quarries during their off season to supplement the family income. A major product of Saugerties quarries of the mid-1800s was bluestone, a dense, fine-grained sandstone found in New York State, New Jersey, Pennsylvania, and Canada. When wet or freshly cut, it appears blue, and it splits easily into slabs, making it useful for applications like counter tops, fireplaces, window sills, and sidewalks. The bluestone found in the Saugerties area was considered to be the best quality, for his color, strength, durability, and uniformity. The town of Saugerties was particularly convenient for the production of bluestone, given its location at the intersection of the Hudson River and Esophus Creek. After removal from a quarry using simple tools, the cut slabs were transported by horse or oxen to dealers at the river docks, then sent to New York City on barges. The bluestone industry provided a livelihood for a wide variety of workers in the nineteenth century beyond the stone cutters, such as tool makers, black smiths, stone millers, and dock and barge men. It was a profitable business too – in today’s dollars, the bluestone trade in 1890 generated about $83 million. With so much money to be made, it’s no wonder that corrupt NYC politician Boss Tweed made sure to get his own cut, making a deal with the New York and Pennsylvania Bluestone Company to pave the city’s sidewalks. By the late 19th century, cement became the paving material of choice in New York City. It was widely available in the US after the civil war, and was a fraction of the cost of bluestone to produce and install. 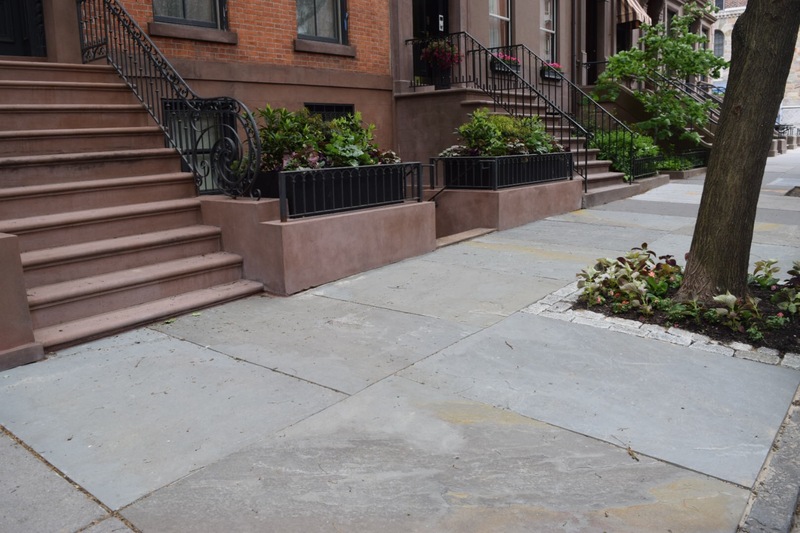 At its height, bluestone paving accounted for half of city sidewalks, while by the late 20th century only five percent remained. Gentrification of some older neighborhoods in Brooklyn, as well as renewed interest in authentic restoration of historic building details, has led to something of a resurgence in bluestone. While a bluestone sidewalk or patio will cost about four times as much as concrete, it will last much longer, isn’t slippery in the rain, and provides a more beautiful and historically correct look. The interest in this valuable building material has reached the point that thieves are unfortunately finding a new market, going so far as lifting Kingston, NY sidewalk slabs (weighing upwards of 500 pounds each) out of the ground and selling them to local antiques dealer.